What is this strong, graceful creature? The latest Frame of the Week is one of the boldest statements from l.a.Eyeworks' newest collection! 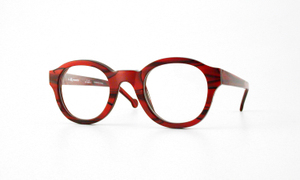 Available exclusively in l.a.Eyeworks Los Angeles retail stores, the Braga frame (seen here is Red Stir) evokes the best qualities of a classic frame gone thoroughly modern. Strong, and strongly fashion forward, Braga is made of rich Italian acetate, and feature an exclusive l.a.Eyeworks custom-made color! The limited edition frame comes in two other fantastic colors that you can see at the FOTW photo gallery.